As a child I secretly always wanted one job, to be head cheerleader. To rally the troops, support the pyramids and back handsprings, to lead the cheering section for the Mississippi State Bulldogs, to be in charge of picking out uniforms and coordinating bows. More than 20 years later, my life has come full circle, and I am starting my dream job as head cheerleader. No, I still can not do a back handspring, nor should I ever try. But my inner wealth of optimism, energy, enthusiasm and love of the team has landed me right where I am supposed to be, Executive Director of the Alzheimer's Association, West Virginia Chapter. Many years ago, these qualities made me an ideal candidate to rally our Walk committees, cheering on our great volunteers as we reached event success. Many of you remember those years! When I took that job, I did not know I would fall in love with this place, the people and our work. But, I quickly discovered that the Alzheimer's Association was and would remain my home. As I take on this new role, I move forward under the lens of head cheerleader. We have a truly remarkable team. Our staff does amazing things with great enthusiasm on a zero budget. We are supported by an unbelievable community of dedicated and passionate volunteers who make our work possible. As I sit here today I feel truly blessed that it is my job to rally, cheer and inspire these amazing people and their important work. We have so much to do, our work is hard, and often sad. But, together we can achieve great things. I know my rose-colored optimism can't solve every challenge we will face. I know there will be tough times, and often even harder decisions. I know that as of today, the buck stops here. But, what makes these hard times navigable is our love. 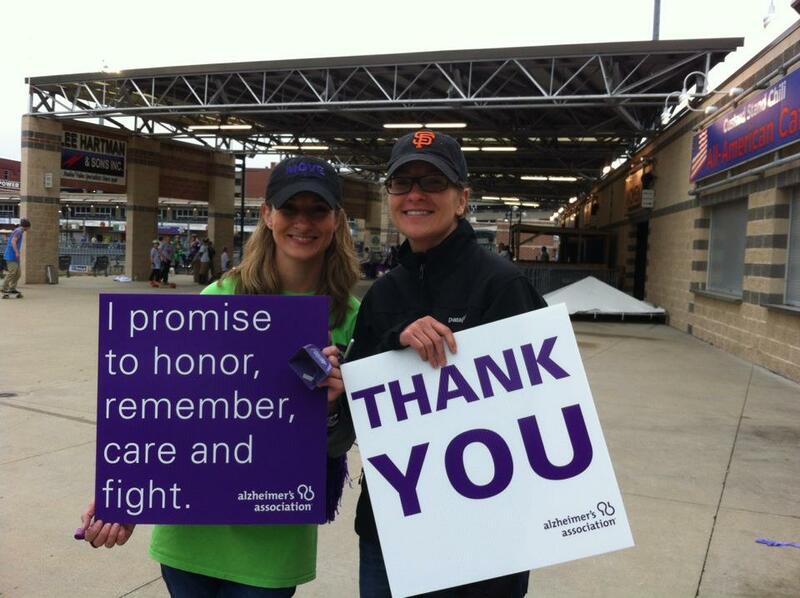 The Alzheimer's Association was founded on a community of love. While we don't always see eye-to-eye, we love each other, we love our work and we love the people we serve. We survive as caregivers because of love. I am going to need you. I hope you will not only join our cheering section, but join our team. Be an advocate, join a Walk to End Alzheimer's, join one of our planning committees, host a community workshop, or just simply drop off our newsletters at your church or library. The end of Alzheimer's starts with me, and the end of Alzheimer's starts with you. Together we can change the future. So, I thank you in advance of your great support. Today is just the first day of an amazing adventure that is going to change the world, so I hope you will come with me. The Director's Dish is a weekly blog to keep you posted on the latest news from the Alzheimer's Association, West Virginia Chapter. From upcoming events, to the latest in research to chapter news, the Dish will offer the insider scoop along with a recipe reminder to make sure you do something for yourself this week. I hope you will use the link to the left to sign up to receive our weekly emails! The real focus of this blog is all about taking care of yourself. That message is on repeat at our office, we tell our caregivers on a daily basis to make time for yourself, just like the stewardesses on an airplane tell you to put your oxygen mask on first. I also preach this same message to our staff, we are caregivers in our own right. But, it is much easier to say this than put it in practice. You can't always get away to have a moment for yourself. Over the years we have adjusted the message, focusing on Jolene Brackey's philosophy of creating moments of joy within the span of a day. Building in time everyday, whether you are folding laundry or taking a walk to get the mail, a moment to take a deep breath and refresh. My true stress relief moments come in the river with my fishing pole, gardening or heading out for a run. But, with hectic schedules the times I can make it down to the river get fewer and fewer. But staying true to our own advice, I have found a way to cope with my stress. And that outlet is what this blog is all about. One of the hallmarks of my family is our love of food. We moved around growing up, and our parents made sure we indulged in culinary adventures along the way. From TX brisket, LA gumbo, Friday night catfish at my grandparents small TN town. My mother is a fantastic cook, she expertly incorporates regional flavors and ingredients, creating our eclectic palate. Mealtime is sacred to us, an opportunity to reconnect, reconvene and share our love for each other. My mother is also very health conscious cook, she deserves an award as possibly the only mother whose children demanded more wheat germ, (aka crunchies!). My parents taught us to love the creativity of cooking, so much so that my brother grew up to be chef. I am not a chef. I don't even cook every night. But, I love the creativity of cooking. I love being able to produce a product that nourishes not only me but the people I love. When my better half and I cook together, the worries of the day melt away, we find ourselves laughing and cutting up, completely stress free. I know that not everyone enjoys cooking as much as I do. And, on the reverse a number of you will see my recipes as entirely too simple (again, I am clearly not a chef!). But, what I hope is that each new recipe brings a reminder to do something for yourself. Something that you love, that makes you laugh out loud, use your brain in a different way or just a moment to breathe deeply. Well, get on with the recipe! I have spent the last 6 months trying to decide what my first recipe would be on my very first day of the job. What recipe best describes who I am, and who I want to be as a leader of the Alzheimer's Association? SO much PRESSURE! Heat up a griddle or skillet to medium-high heat. While you gather the rest of your ingredients, melt 3 tbs. of butter in the microwave, then let cool on the counter while you build the rest of the batter. In a large bowl mix together 2 cups of flour, 3 tbs. of baking powder and 1/4 tsp of salt. When it comes to milk, you have a number of options. First, you can use regular milk or if you are feeling particularly healthy go for coconut milk or almond milk (just as delicious) Then you have to decide how fluffy you want your pancakes. If you like them thick, add 1 3/4 cup of milk, a little flatter pancake pour in 2 cups. Stir in one egg and 1 tbs of sugar. Then it is time to add the secret ingredient to the deliciousness of my pancakes, 1 tsp. of vanilla extract. (don't tell anyone!) Finally, whisk in the butter, in my house this is a two person job, one to pour one to stir. Now, you are ready for the griddle! Pour out the batter, Add in a ton of blueberries, frozen ones work during the winter! (Authors note: yes, that is a mini-pancake between my two big pancakes, you really work up an appetite when you are making pancakes! )Flip when the pancake starts to bubble. Even though your pancakes are cooked you need the final ingredient. Fry an egg to your preferred consistency, (over medium for me) and put it right on top of your double stack! This addition is courtesy of my dad, I know it sounds like an odd combination, but once you try you will never go back!